A natural companion to Windsor chairs - the perfect table! Johan designed these tables to compliment any chair - but the tables work beautifully with a set of Windsors surrounding them! Table tops are solid wood and made to order. The tops are hand-planed in the final finishing process to give them the distressed look of a table that has been in use for generations. Let the kids run their toy cars across them - play cards - enjoy a family meal...these tables will stand the test of time. Tables can be sized to fit perfectly in your dining room, kitchen, or nook. Choose maple, walnut, pine, hickory, linden or oak for your unique table. This table is 39" wide by 68" long. The knotty pine top has been left natural with a polyurethane finish. Apron and legs are painted black using Old-Fashioned Milk Paint - a durable finish that is non-toxic and safe for all ages. This table retails for $900 in pine. A close-up view of the top shows the character of the knotty pine top. A clear epoxy is poured into the knots so that the top is smooth. Photo above shows a solid hickory top with breadboard ends & tapered legs. The legs and apron are painted black. The top is left natural with a seal coat. Size shown is 36 inches wide by 60 inches long. These tables can be sized to your specific need. Table tops can be created in walnut, oak, pine, maple, etc. The leg styles can be customized as well. Shown is a tapered leg - painted with Milk Paint. This table (in hickory) retails for $750 plus shipping. 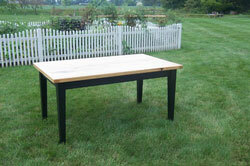 This solid walnut farm-style table was a custom order. The legs were turned based on the customer's design working with Johan to achieve the look they wanted. Call for a quote to design your perfect table! 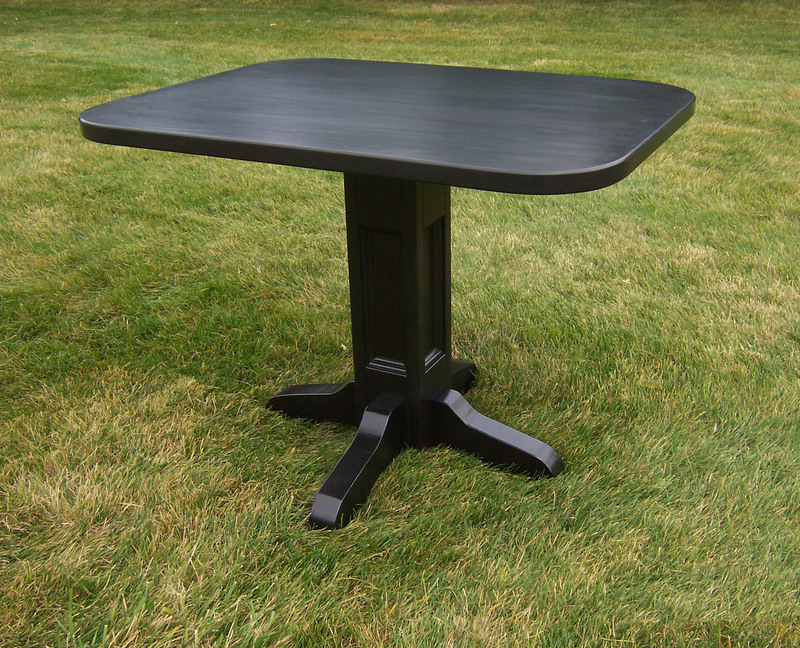 The pedestal table was custom designed to fit a kitchen nook. The top is American Linden and finished with a solid black finish and polyurethane final coat. 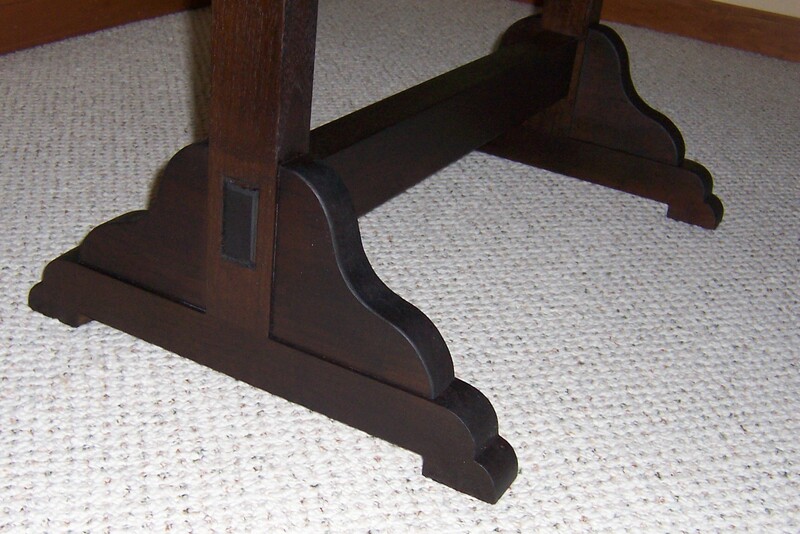 The pedestal column / foot design makes this table very stable - and architecturally interesting. This table retails for $800 plus shipping. This refectory table (the leaves store under the top) was designed for customers who wanted a table to fit nicely in the eating area and easily expand for large family dinners. No more storing table leaves, dragging them out, pulling the table apart. The leaves pull out and pop into place easily and quickly. The table top is cherry - harvested by the customers from their woods. The legs and apron are poplar. Call for a quote on this very unique table. 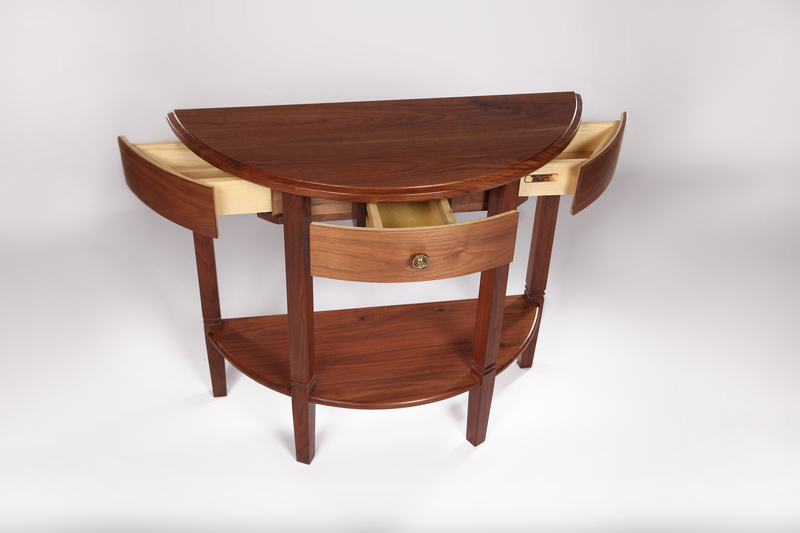 The handsome desk shown at right features a black walnut top. It looks perfect with the New York City side chair or the Nantucket Fanback Windsor. Center drawer front is walnut. Legs and apron painted black. Additional office furniture can be ordered. Wood file cabinets, credenzas, printer tables, etc. Desk top is 28 inches by 50 inches. Desk (in walnut) retails for $800 plus shipping. 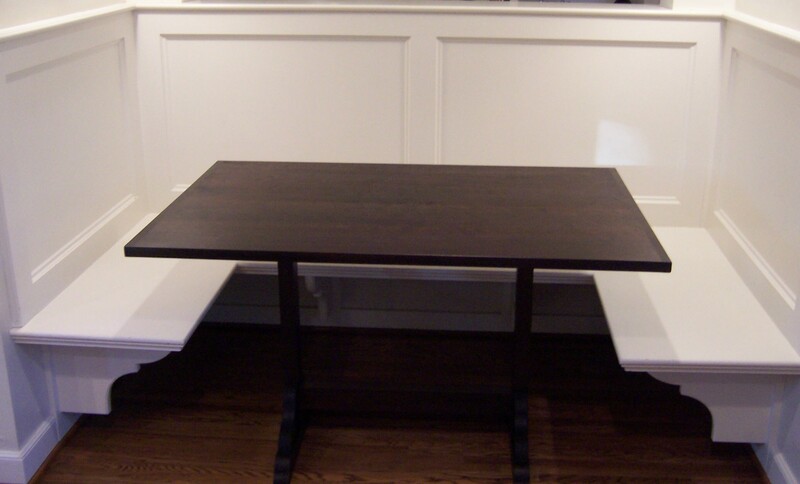 This trestle table was created to fit into a custom banquette space in an old home. The table is solid walnut. The top features a breadboard end and dark stain. All leg and trestle joints are full length mortise and tenon construction. The table top shown is 30" by 50" in walnut. Price is $1,200 walnut or cherry. Other woods can be used - ask for pricing. This versatile table is known by many names - demilune, occasional, foyer, or half-round. Whatever you call it, this walnut demilune table is beautiful. It was commissioned by a customer as a gift for his bride. The center drawer is apparent, but the drawers on the left and right are hidden. The customer wanted a place to hide objects in "plain sight" so to speak. The table can be reproduced to order in walnut, maple, oak, pine, or other wood. Retails for $800 plus shipping in walnut or cherry. Call for quote in pine, oak or other wood.